“On the day before the day before the New Year/ the snow is falling on my prairie home/ and I'm so far from where I started/ but no closer to where I belong.” - Learning To Lose - Margo Price-Jeremy Ivey. 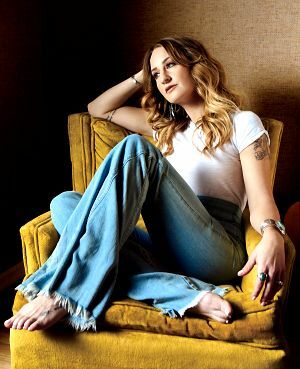 Midwest Farmer's Daughter Margo Price enjoyed good tidings on the eve of her debut Australian tour in October. Her guitarist husband Jeremy Ivey discovered moonshine barrels from an historic still on the hill in the back of their five acre home north of Nashville where outlaw Jesse James and his gang once roamed. And acclaimed singer-songwriter Margo also has her own brand of marijuana akin to Octogenarian mentor Willie Nelson's Reserve. “They're in the process of growing this amazing plant, we couldn't decide what strain it was going to be,” Margo revealed in an interview with Nu Country TV from her pick-up truck in her home driveway. “I'm really looking forward to that. A lot of people want to sell action figures or lunch boxes or have their own line of clothing or whatever. I just want to get into selling weed because it's going to be very profitable in the coming years. My brand is Indica which is good for insomnia. It's very relaxing, it's a beautiful purple colour and I'm very pleased with how it came out. 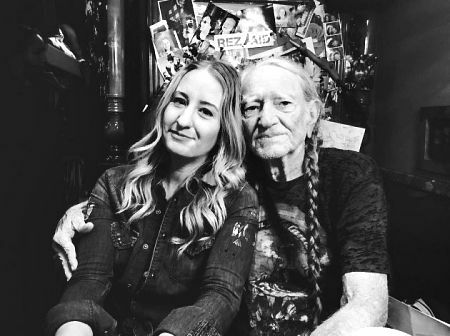 Shotgun Willie, now 85, hosts Margo, just 35, in concerts at his chapel in his movie town Luck, his July 4 Picnics, tours and annual Farm Aid concert this month in Hartford , Connecticut. The Red Headed Stranger also played his trusty guitar Trigger and sang with Margo on her song Learning To Lose in his home studio on her second solo album All American Made. “It was quite an honour to have him on that song,” Margo explained. “It was very surreal. My husband and I went out to his studio and hung out with him for the day. It was pretty incredible. We were in the studio all day, we just hung out inside. It was not a golfing day. It was in January. It ended up being the day before the day before New Year like the lyrics in the song. It was quite serendipitous. “On the highway at night, the lights blazing red/ there ain't no sounds except the pounding in my head/ and a couple cop sirens blaring for me/ they stopped me en route to the refinery/ they say "you look mean," "the kettle is black! "/ they punched me for that one/ and threw me in the back/ they say, "you've been drinking" I said, "yes, of course/ but it ain't drunk driving/ if you're riding a horse." - It Ain't Drink Driving If You're Riding A Horse - Margo Price. It wasn't Margo's first visit to Willie's ranch, golf course and movie town Luck at Spicewood near Austin. She filmed and recorded live acoustic videos of her songs including It Ain't Drink Driving If You're Riding A Horse, How The Mighty Have Fallen and Desperate And Depressed in Willie's movie town Luck Chapel with a single microphone. Margo was accompanied by guitarist Ivey, Jamie Davis on harmonica, pianist Micah Hulscher on accordion and steelist Luke Schneider on resonator. “It was really cool playing in Willie's chapel,” Margo recalled of performing the videos that are among many of hers played on Nu Country TV. 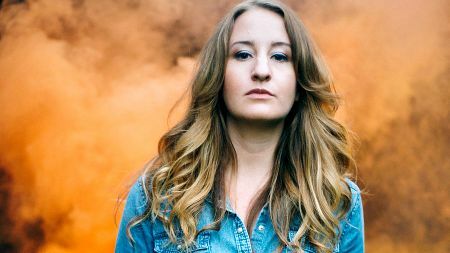 It was a far cry from her arrival in Nashville at 20 in 2003 when she toiled at labouring, teaching dance and waitressing before recording three albums with her band Buffalo Clover and another as Margo & The Price Tags whose members included Sturgill Simpson and Kenny Vaughan. 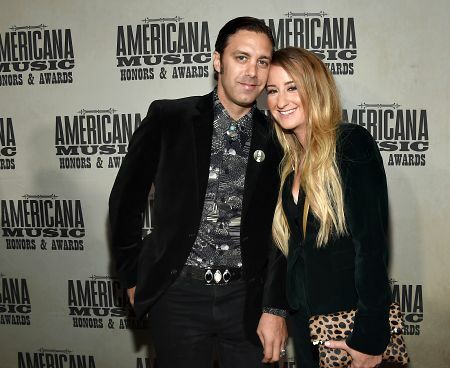 Margo and husband Jeremy pawned their wedding ring, car and instruments to finance recording of her first solo album Mid-West Farmer's Daughter at the famed Sun Studios in Memphis. And, after her success, the wedding ring boomeranged to Jerry's custody. “We got the ring back, I'm wearing it now,” Margo proudly proclaimed. It was a different yard to where Jeremy and their son Judah discovered some historic barrels on their hill. “I'm just sitting here in my truck in the sunshine looking out at the woods on our five acres,” Margo added. “They took me down to cellblock B/ after stripping off my clothes/ put me in a monkey suit/ and threw me in the throes/ like a rat in a maze/ a cow in the herd/ or a sparrow with a broken wing/ now I know the reason why/ the caged bird has to sing/ cause I'm just a weekender/ in the Davidson County Jail/ and my old man, he ain't got the cash/ to even go my bail/ should have listened to my mama/ and quit my life of sin/ before I went backsliding again.” - Weekender - Margo Price. Unlike her childhood farm at Buffalo Prairie near Aledo , Illinois , that inspired Hands Of Time and her All American Made album title track the stills have not yet fermented a song. “We're talking about making some shine but we don't have any plants,” said the singer who spent time in the Davidson County Jail when she was grieving and drinking after the death of her twin son Ezra due to a heart ailment two weeks after his birth. “I spent a weekend in there and thought I better make use of my time and delinquency by at least getting a song out of it,” Price explained of the embryo of her biographical Weekender from her debut disc. Price also parodies faux outlaws in Cocaine Outlaws and explores gender income inequality in Pay Gap. “ Cocaine Cowboys gets really good reaction,” Margo confessed. “When I rolled out of town on the unpaved road/ I was fifty-seven dollars from being broke/ kissed my mama and my sisters and I said goodbye/ and with my suitcase packed I wiped the tears from my eyes/ times they were tough growing up at home/ my daddy lost the farm when I was two years old/ took a job at the prison working second shift/ and that's the last time I let them take what should be his.” - Hands Of Time - Margo Price. Margo recently released an updated graphic video of Hands Of Time from Midwest Farmer's Daughter - inspired by the Price patriarch and other relatives forced to sell their farms because of bank foreclosures. “I also felt for my grandparents when their farms were sold from under them,” says Price whose father later was a prison guard. There is a parallel of sorts to Price's arrival in Nashville when her waitressing job at the Flying Saucer café required her to dress in a Catholic schoolgirl's uniform. “I don't know why I did that, I guess it paid good money,” Price quipped. “Well, all the Midwest farms are turning into plastic homes/ and my uncle started drinking when the bank denied the loan/ but now it's liver failure and there's mad cows being cloned/ and it's all American made/ but I was just a child unaware of the effects/ raised on sports and Jesus and all the usual suspects/ so tell me, Mr Petty, what do you think will happen next/ that's all American made.” - All American Made - Margo Price-Jeremy Ivey. Margo name checks the late Tom Petty in All American Made that expands on her family and other small town farmers being forced off their land. Price also explores other inequities of manufacturing and wealth creation in a nation where song writing is sweet solace for her family and peers. She is also indebted to her songwriter great uncle Bobby Fischer who co-wrote Reba McEntire hit You Lie. “I admired him and where he came from, he got a start later in life,” Margo declared proudly. Margo will also seek advice on another Octogenarian Willie of guidance of her Australian tour where she will showcase new songs for her third solo album. “Willie hasn't given me any advice but I'm going to see him pretty soon,” said Margo who joined Nelson at Farm Aid . Margo opens her tour on Wednesday October 10 at the Caravan Club in Bentleigh, Thornbury Theatre on Friday October 12 and Oxford Arts Factory in Sydney on Tuesday October 16. She also performs with Kevin Welch, Joshua Hedley, Kasey Chambers, Shane Howard, Little Georgia , Alan Pigram, Weeping Willows , Diesel and other artists at the second Australian Americana Awards on Thursday October 11 at Thornbury Theatre. Sierra Ferrell, Birdcloud, The Rechords, Emilee South, Dan Parsons, The Cartridge Family, Georgia State Line , Davy Craddock and Weeping Willows . And on Sunday October 14 she play A Taste of Americana Festival at Enmore Theatre in Sydney with Kevin Welch, Joshua Hedley, Willie Watson, Kasey Chambers, William Crighton and Little Georgia .